tetroid wrote: Yes, my second step - EP1810 replacement. Have some problems to convert INGOT 20 to Atlra MAX. Original INGOT20 have errors, I try to check the JED code manually. Impressive again! But wouldn't it be easier to design the whole logic from scratch instead of reproducing the original EP1810? Another remark: It could make sense to solder the DRAM directly to the PCB... by Q60 VRAM experience, the sockets add more risk of contact problems, but little benefit. Well, I ordered one and it arrived today! 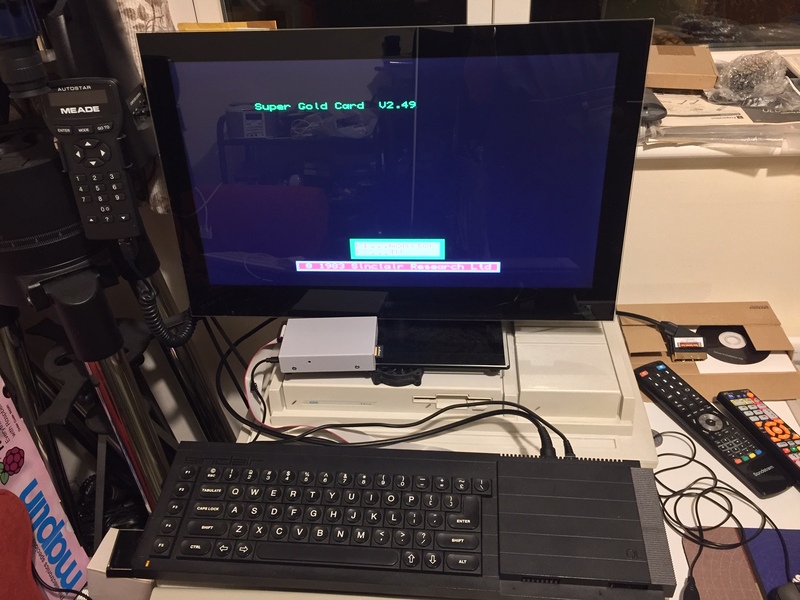 Working fine (haven't tested floppies). My cloned SGC also arrived recently! Nicely packaged and beautifully built, though no enclosed instructions - not a problem here. To differentiate my various EPROMs (I have 4 QLs now - don't ask...), I adjusted the Minerva version string from "1.98" to "1b98" before burning that EPROM. Silly me! I'll re-burn a fresh EPROM without tweaking the version ID and try again. But it did get me wondering about ROM compatibility with SGC - namely, even with the Minerva version ID set to something SGC will actually recognise, might we hit problems with say, Marcel's IO Fixed version, due to byte-offsets changing (one additional instruction, in that case)? I'll need to review the SGC ROM patching code to know how sensitive it will be to small ROM changes/fixes. Got mine yesterday. Haven't had a chance to plug it in yet. Soon though. martyn_hill wrote: To differentiate my various EPROMs (I have 4 QLs now - don't ask...), I adjusted the Minerva version string from "1.98" to "1b98" before burning that EPROM. This is only a problem because you used a lower-case letter. 1B98 would have been accepted by the SGC ROM. Fixed offsets are only employed for known Sinclair ROMs (and these are fixes not needed on Minerva anyway). The bulk of the patches don't use fixed ROM offsets but are guided by vectors or scan the whole ROM for specific patterns. As long as you don't fiddle with the MDV, SER or reset code you should be fine. Interestingly the patch code supplied with SMSQ/E doesn't seem to be the original source code for the patch ROM but a disassembly. A very good disassembly at times, but only done halve-way. I think I've hit something with Min1.98 (original, with Marcel's IO fix plus my own 'adjusted' copy) when running on the (cloned) SGC. Whether this is an issue with the cloned SGC (which I doubt very much) or an incompatibility between the SGC patching mechanism (v2.49 ROM as shipped with Tetroid's lovely clone) and Minnie 1.98, I'm not sure. Well it has taken a little time, but ... my SGC(C) is in and working. And my SGC(Real!) is also working. I haven't kept this one in use as I really don't want to damage it in the (Tetroids) vertical expansion extender. 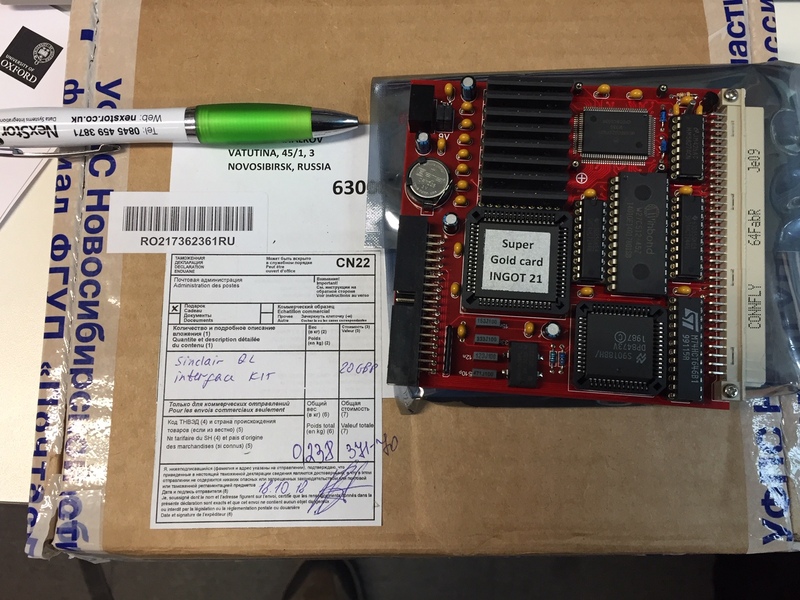 So my super beast is running the SGC(C), a (Tetroid) QUBIDE, and 512KB memory. The OS is Min1.98. The (few) problems I had with both SGCs and the expander board were quickly sorted by Tetroid, who emailed me the fix within minutes! My vDrive QL doesn't like working with the other FDDs and HDDs, or their interfaces, but that's no great problem. I am think not real to make the new batch of this clone. I am sorry, I cant find the original NORMAL old date code EP1810. I tryed to buy several EP1810 parts - all parts from China / Taiwan is fake - refurbished ( remarked from new date code ) or programmed. I have no chance to find the guaranteed original non programmed old date code EP1810. I think is possible on USA only , but I have no access to US warehouses. Are there any more modern CPLDs / FPGAs that can be used in place of the EP1810? Having asked that I would like to thank you for all of the, obviously, hard work that you have put in designing and developing your QL accessories. You have produced wonders with very limited resources.